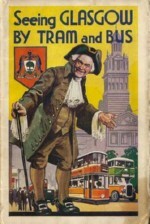 Click on any tram picture on this page for an enlarged version. the larger the browser window, the bigger the picture will be seen in most cases! I was delighted to hear that Glasgow Standard 488 is to run again at Carlton Colville. This is a very special tram for which I retain a strong personal attachment. 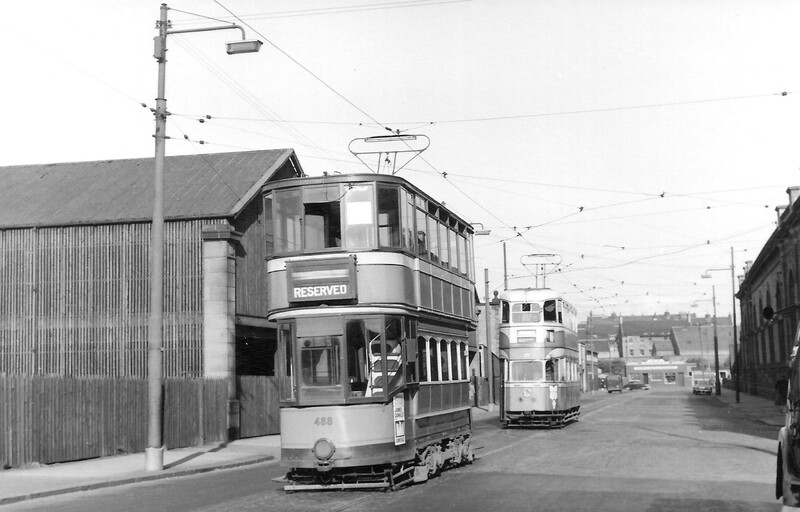 Following the disastrous Dalmarnock depot fire of 22nd March 1961 in which 50 cars were destroyed, Glasgow Corporation returned several recently withdrawn cars to service and to provide a maximum fleet of available trams a few Standards and Kilmarnock bogies were kept on the road. Perhaps most significantly they also re-instated a couple of preserved cars which had already been beautifully restored. 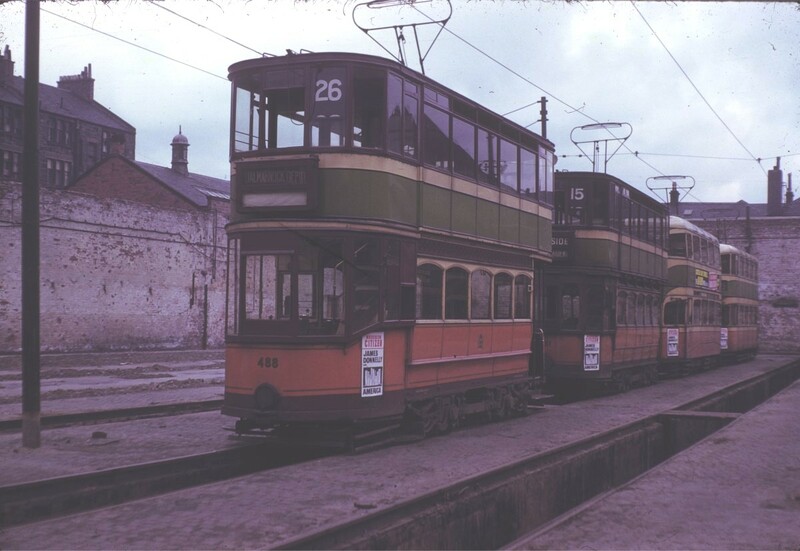 These were round-dash Standard 488 of 1903 and hex-dash Standard 1088 of 1924 both of which were assigned to Dalmarnock depot. For the enthusiast this was a true Indian summer. 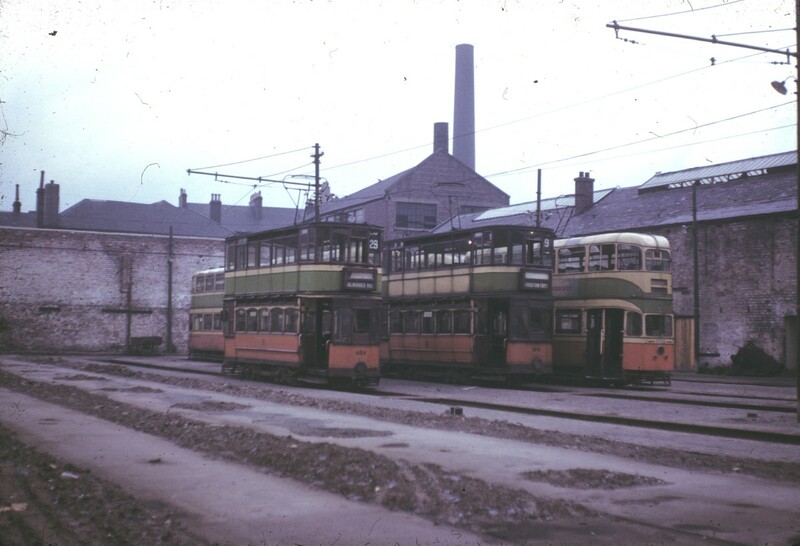 For a few months it was possible to ride and photograph these cars in all-day service but the end came all too swiftly with replacement of services 18/18A as from 4th June 1961. Determined to sample these classic cars for the last time, I made the journey north on Thursday 1 June 1961 with another enthusiast, the late Allan Clayton. On the Friday, we spent the entire day riding the surviving Standards and Kilmarnocks and chatting to the crews most of whom were very friendly and amenable. As a result, we managed to take the controls for a few short trips. My records show that Standards 585 [Partick depot] and 1051 [Dalmarnock] were withdrawn after the Friday evening peak hour and I recall driving 1051 into open section of Dalmarnock for the last time. It was scrapped shortly afterwards. Having ascertained that 488 and 1088 were both going to be working the next day, we were up bright and early. In the morning we rode Kilmarnock bogie cars 1106 [service 9] and 1133 [service 26]. 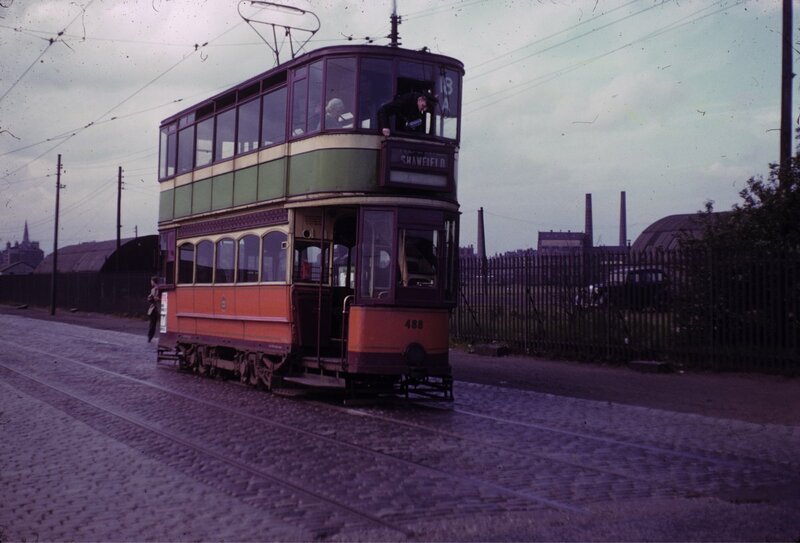 During the mid-morning peak [this was the era of the 5½ day week] we rode on 1088 on its last-ever duty, a short-working 15 from the city to Shettleston. I drove the car over the cross-over and then having cleared the major intersection at Parkhead I again took the controls for the journey back to Dalmarnock depot. The only Standard now in service was 488. 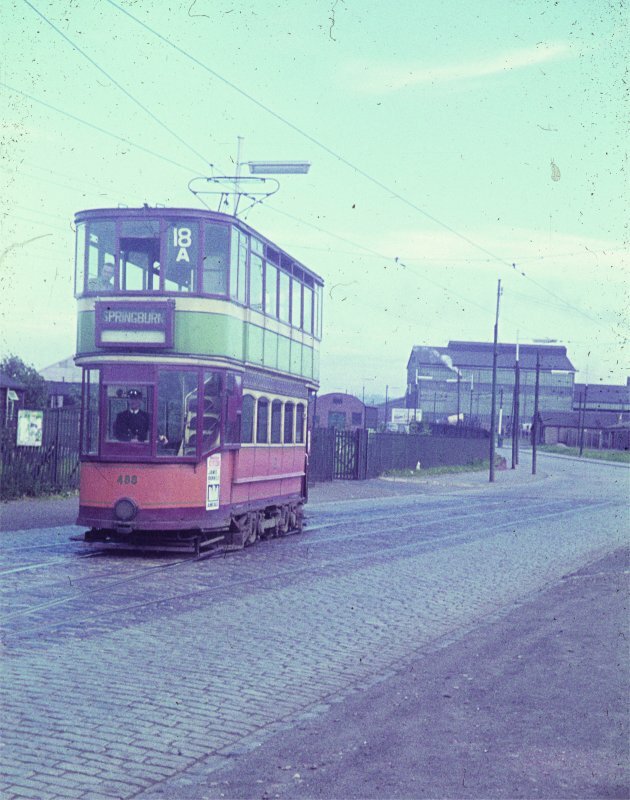 During the afternoon and early evening, several trips were made to Springburn and from there to either Burnside  or Shawfield [18A]. I only wish I had recorded the exact time of these runs. 488 was in immaculate condition - a credit to the workforce at Coplawhill. Her paint work sparkled and her interior gleamed. She rode splendidly and her recently renovated body was solid and devoid of the loose joints that had increasingly bedevilled the neglected Standards. It was like riding a time-warp. In the late evening, we had a last trip on 1133. 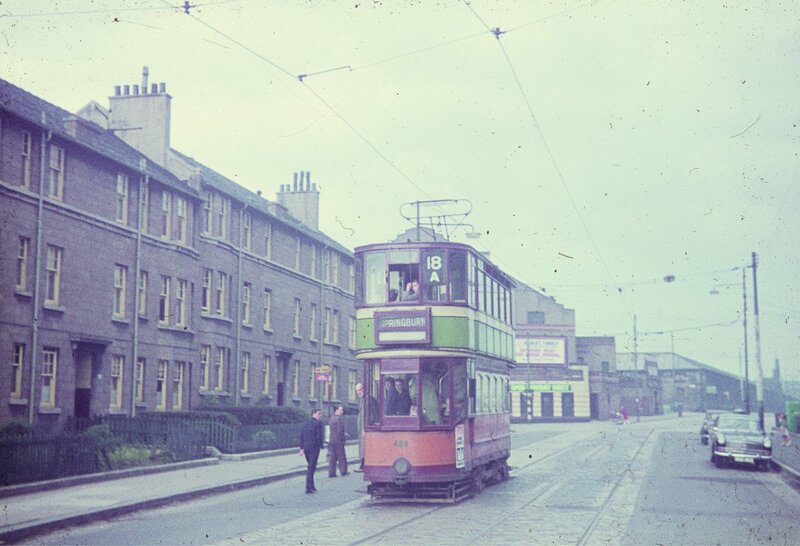 After taking a precious flash-light colour slide, we switched to 488 riding first from the city to Springburn. Having spoken to the crew earlier in the day, I was permitted to drive the car on its last-ever cross-city duty from Springburn as far as Ruchill at the junction with the Maryhill Road. I remember the thrill of taking the Standard round the famous tight curves either side of the bridge under the Forth & Clyde Canal. At this long distance I don't recall who else was on board. Some enthusiasts avoided last nights like the plague but this had seemed too special an occasion to miss and the car was reasonably filled with fellow-enthusiasts and ordinary passengers. On arrival at Springburn more flash-light colour slides before the final run into Dalmarnock during which I drove the car from the cross-over at Dalmarnock into Ruby street and then into the confines of the depot. The abandonment's of the 3rd June 1961 were significant for different reasons. 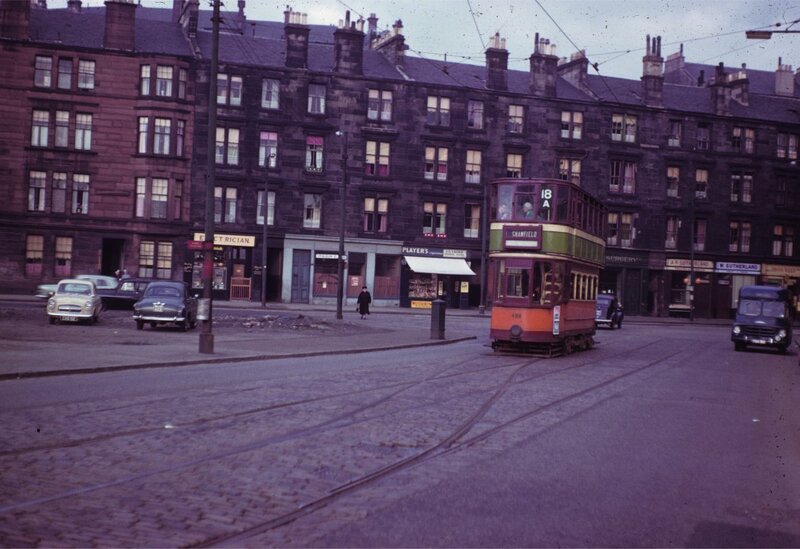 Sauchiehall Street was now all bus and Argyle Street ceased to be the last major British city street to be served exclusively by trams. 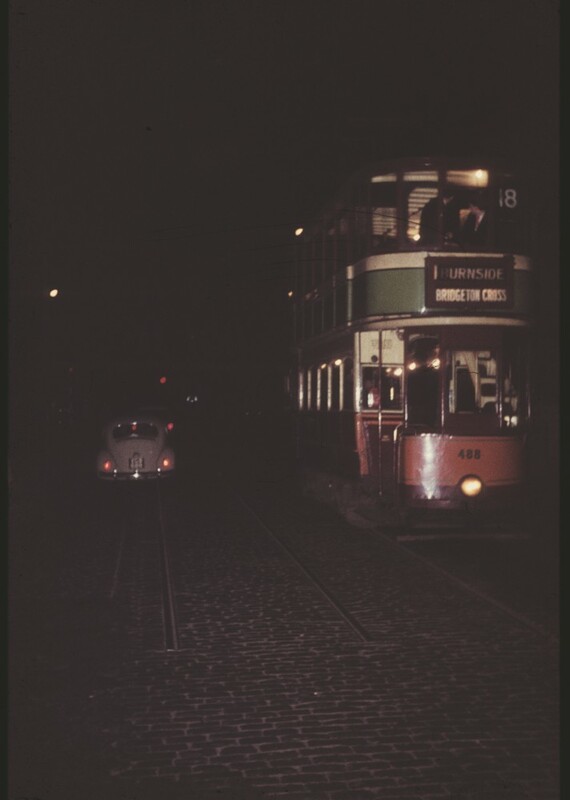 Historically, 488 became the last-ever traditional four-wheel British double-decker tram to carry ordinary fare-paying passengers and I now realise I had the unique privilege of being at the controls during the final lap of its historic journey. What I would give to put the clock back. However, now I know I must hang on long enough to hopefully see 488 once again carrying passengers. That will be quite a day! 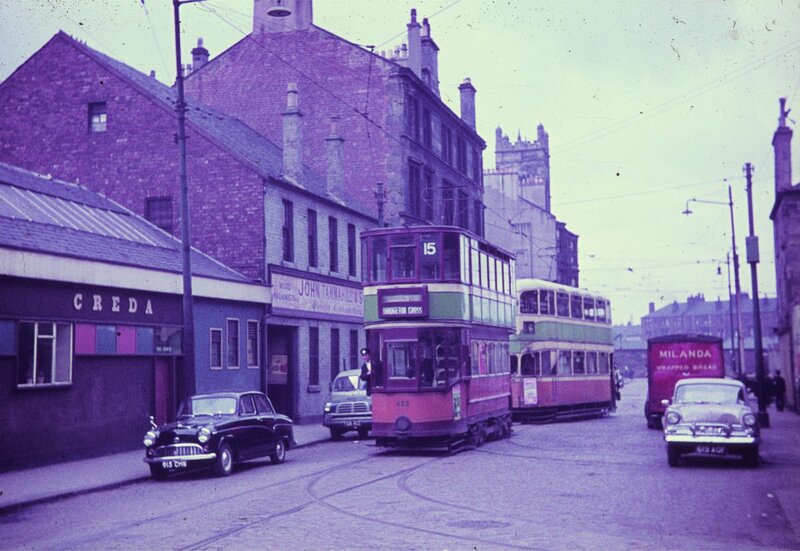 The colour pictures of 488 were taken on 3rd June 1961. The B&W picture by Hamish Stevenson shows 488 with 1005 standing outside Coplawhill Works prior to an enthusiast tour on 4th June 1961. 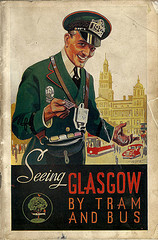 The tour would visit Maryhill Depot, Dalmarnock Depot, Tollcross and Coplawhill Car works. This would be the last time that 488 would earn revenue for GCT.